Hi, lovelies! It feels as if I haven’t blogged in forever although it’s only been 4 or 5 days since I last posted. I mentioned previously that I was moving so my latest posts were pre-written and queued. So in reality this is the first time in weeks that I write a fresh new post. I was so stressed and exhausted after moving that I decided to take a small break from blogging. I’m still in the process of decorating my room, but I find that to be fun and not too time consuming. I’ve been off Twitter, Facebook, and Instagram during the last couple of days. I even stopped checking my emails and blog comments! It was nice to disconnect completely but I missed blogging and social media interactions. I now feel refreshed and eager to create new content for the blog (my blog to-do list is never ending). I also wanted to take this opportunity to showcase two of my lovely advertisers: Grace and Ren. 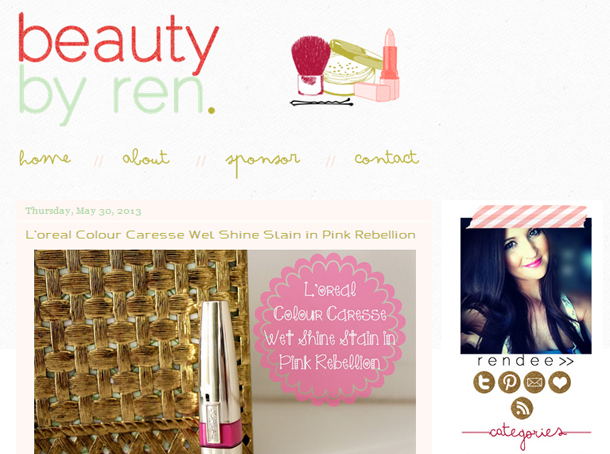 Ren is a gorgeous girl who runs a beauty blog that features reviews, recommendation, and miscellaneous beauty articles. She’s a nursing student from Arizona. I’ve been reading her blog for a long time and have always loved her lip swatches. Well, her swatches in general because they’re really clear and she photographs in really good lighting. You can follow her through Bloglovin’ by clicking here. I’ve featured Grace on my blog previously but if you’re not currently following her then you must! 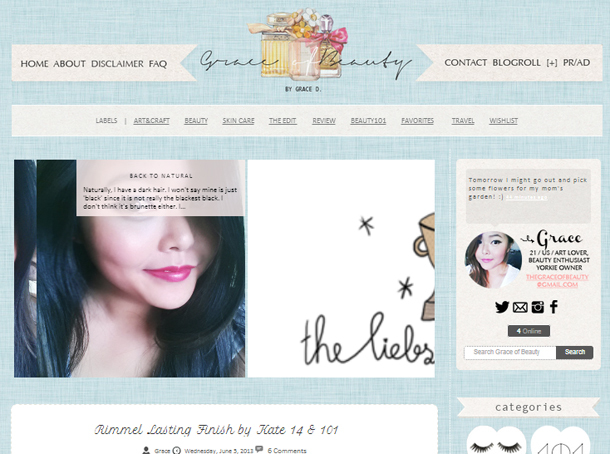 Her blog design is lovely and her posts are quite varied (although most are somewhat beauty centered). I feel like her blog is a breath of fresh air. You can follow her through Bloglovin’ by clicking here. I also wanted to include some pictures from my mini holiday break. I took the chance to visit a lot of lovely places that my country has to offer like beaches, rivers, and forests. Yes, it was a very “nature-centered” getaway. 🙂 A lot of the times I didn’t even have cellphone reception so I was literally disconnected. Let me know if you’ve also already started your summer vacations. If you have then I hope you’re enjoying them! I love your pictures! Seems like you had a great time and omg, the location is amazing 🙂 Great post! Such beautiful photos, the scenery looks amazing too! Beautiful scenery! It looks like such an amazing summer getaway. Love vacation photos and esp seeing your life away from blogging, Coco! ♥ Do post more! All these photos are so damn PRETTY. You look so pretty! And those places are gorgeous!!! Beautiful photos, I love the location. I hope you had a great time! how cute are these pictures?! thanks for linking those blogs. i like them! i love the layouts, esp. i wanna re-do my blog i think! Ahh, you look gorgeous in your pictures. Thanks for sharing out the blogs you love atm because I love finding new blogs. Wow those pictures are so pretty! I wish I lived somewhere that nice. This photos are so beautiful! You look great! Beautiful photos 😀 sadly it's winter here in Australia so I'm huddled up inside at the moment! aww you look so gorgeous in all the pictures coco! !